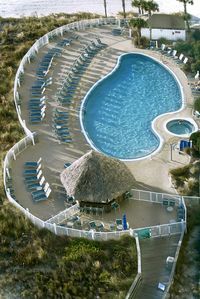 Welcome to The Grand Panama Beach Resort - - one of the newest and all inclusive Luxury Resorts on the Beach. Just the name says it all. 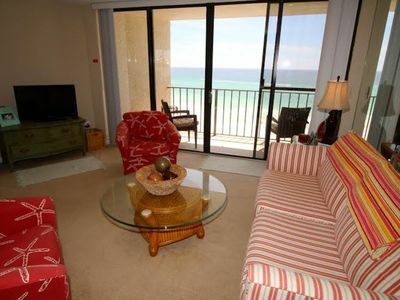 Our condo is located on the 6th floor in Tower I which sits on the fabulous white sands of Panama Beach. 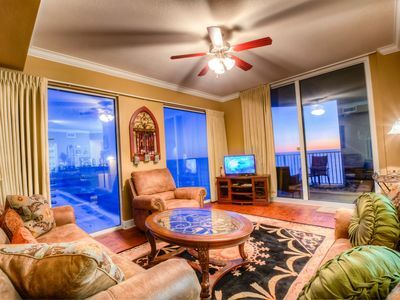 The oversize patio overlooks the beautiful Gulf of Mexico â€¦. 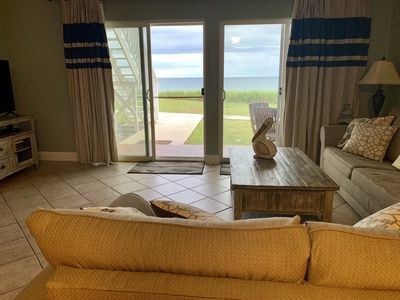 So whether you are enjoying the sunrise while eating breakfast or relaxing while taking in the glowing sky as the sun sets over the Gulfâ€¦ you will see why the view from here is breath taking. 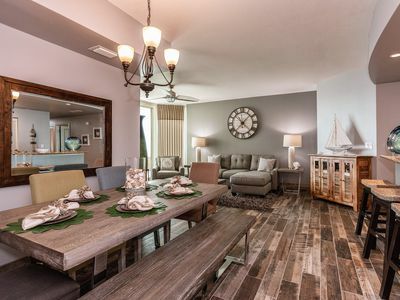 This nicely decorated unit has two bedroom, two baths, bunk beds in alcove hallway and a full pull out sofa sleeper in the living room. There are 3 flat screen TVâ€™s and DVD players to relax and watch your movies. The furnishing are elegant, but has that casual relaxed feeling. 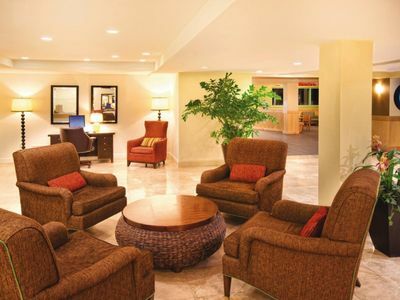 We have tried to provide you with all the amenities you need and itâ€™s new. So whether itâ€™s the fully stocked kitchen, hidden washer and dryer, or maybe you need to just press a shirt, you will find it here for your convenience. 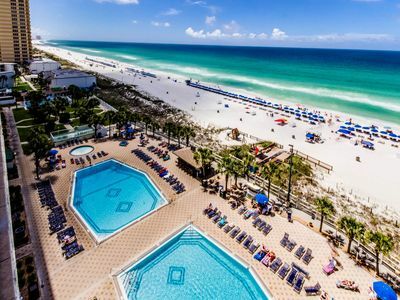 The Grand complex has everything you could want â€¦. 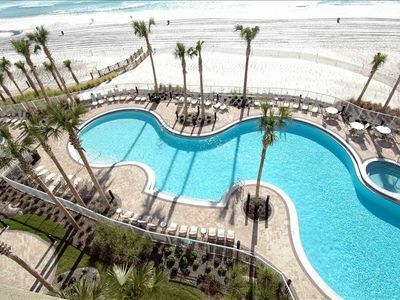 Two beautiful pools with hot tubs & kiddy pools, gorgeous gulf views, 300' of Panama City's world renowned white sandy beaches, Fitness Center, covered parking, picnic area with grills, Wi-Fi connection , jogging and bicycle path around perimeter of complex, scheduled shuttles, and a elevated pedestrian crosswalk. 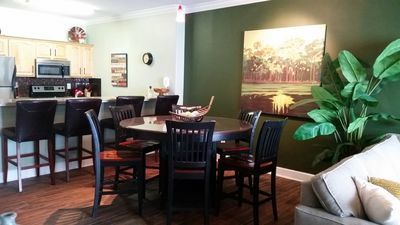 The village also has restaurants (Bonefish Grill, Another Broken Egg, Papa Johnâ€™s) and a luxurious spa and salon, and a wine shop. 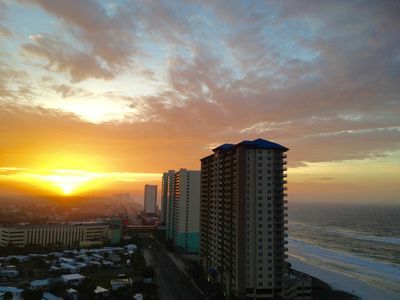 Also, Pier Park is only minutes away with lots of restaurants and shopping. 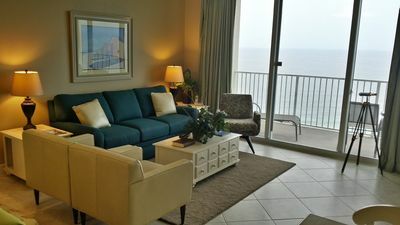 The Grand is only minutes from many great restaurants such as Capt Anderson, Breakers, Fireflyâ€™s, Angeloâ€™s Steak House, Pineapple Willyâ€™s, just to name a few. 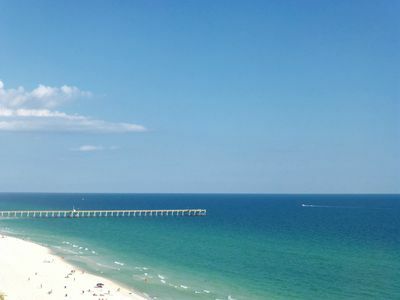 Other great activities are Ripleyâ€™s Believe it or Not Museum, Pier Park (a must see), boat rides to Shell Island, Ship Wreck Island Water Park, Zoo World, Capt. Anderson Marina (Island cruiseâ€™s, dinner cruises, fishing) para sailing, golf courses, diving, adventure parks, and many more. There is something for everyone - - young or old. 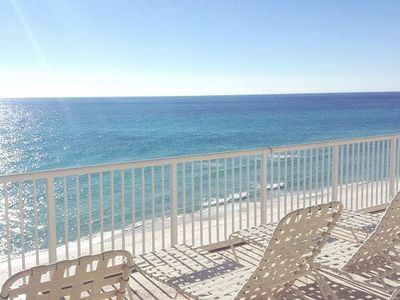 So come to The Grand and relax. 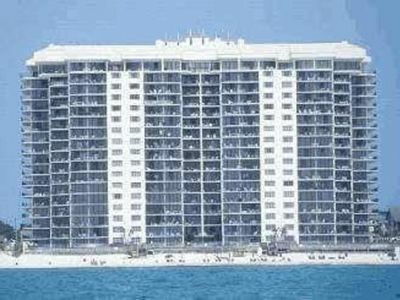 Family owned and very loved condo. 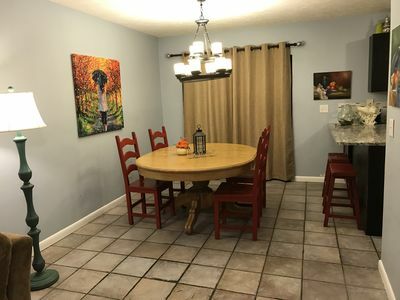 Newly updated with USB connections in bedrooms on night stand and in family room. 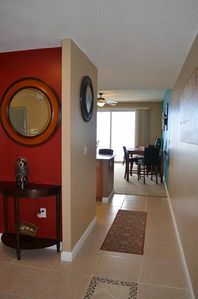 Freshly painted with many new amenities. New Samsung 55â€� tv in family room. 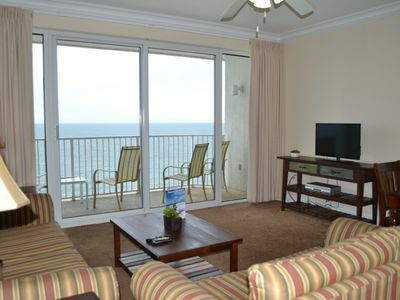 All bedrooms have flatscreen TVs . Installed Schlage entry keypad. Has new deck furniture and area rug under it. Tidewater 1910 - Donâ€™t miss your spring vacation. Book now! 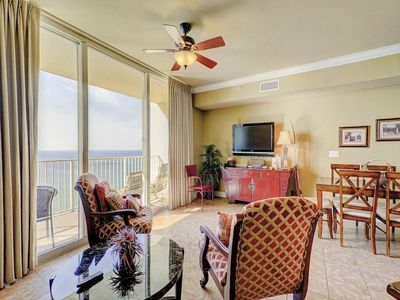 Beautiful Gulf Front unit.Master Bedroom Facing gulf. Stunning View. Book Today! 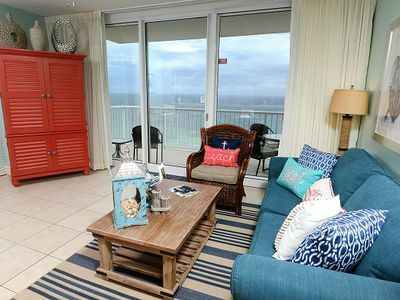 Edgewater 2 Bedroom Gulf Front Tower 3 Beautiful And Best Deals! 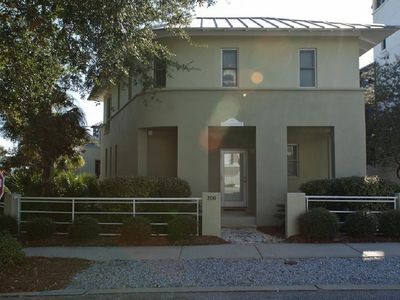 2 Bedroom Home in Carillon Beach! Between Meeting House and Beach! 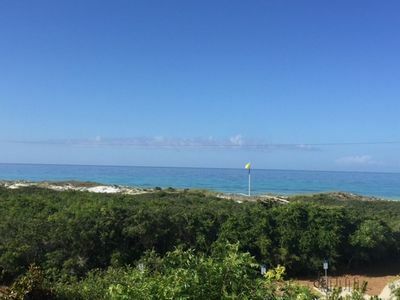 AQUA 1811 LUXURY CONDO - NEWLY REMODELED! BEACH CHAIRS! BREATHTAKING VIEWS!